A perfect cool summer night is one where you can sit back and relax by a fire pit with friends and loved ones. Backyards are an oasis from the real world. Custom Image Hardscape is known for providing excellent service to customers in the greater Sacramento area for their outdoor space needs. Here at Custom Image Hardscape, we are fireplace builders, fire pit builders and more. We are here to ensure that you and your loved ones enjoy your luxurious outdoor living area. In the project, we have created a stunning and comfortable fire pit. With cooler nights in an area like Rocklin, CA, fire pits are becoming extremely popular. Outdoor custom fire pits are also growing in popularity and demand. Our company creates custom fireside projects that completely depend on the customers’ vision. As one of the best fire pit builders in Sacramento, contact us with any question for your next outdoor living space. The structure of this project is just the right size as requested by the customer. The circular shape compliments the look and functionality of this fire pit. This custom fireside has concrete caps that are built over the rustic El Dorado Stone. Here at Custom Image Hardscape, we want our customers to love their custom fireside and be able to thoroughly enjoy them with family and friends. We highlight the wants and needs of our customers and excel in producing their own custom outdoor creations with high-quality materials. A unique and fascinating feature in this custom-made fire pit is the additional sitting bench with an accompanying backrest. This sitting bench and concrete caps were built with El Dorado Stone, exclusive to the local area. The sitting bench utilizes the same materials in order for the outdoor firepit and sitting bench design and layout to match, in terms of style and elegance. The backrest is a lovely touch that is convenient for homeowners and their guests to use. The backrest is smooth, cozy and enjoyable for homeowners and their guests wanting to enjoy cool summer nights in Rocklin, California. With many years of experience, Custom Image Hardscape can easily bring your everyday outdoor space dreams into a reality. This classic fire pit design is luxurious and looks as if it has come out of a magazine spread. The unique homeowners’ vision really shines through with the impressive manipulation and use of colors. The El Dorado Stone is rustic and neutral in color and tone. Some of the El Dorado Stone are the same color in multiple shades creating depth in the custom-made fire pit. The placement of these stones against the concrete grey really makes the fireside stand out. The light yellow background of the sitting bench backrest is calming and a wonderful choice for a luxury outdoor space. Known for its warm and beautiful weather, Rocklin is a city near the greater Sacramento Area. Custom Image Hardscape is your local, top-rated fire pit builder, creating and building deluxe outdoor spaces. This natural gas fire pit is impressively made. This project shone in on the homeowners’ unique taste for design in conjunction with Custom Image Hardscape. 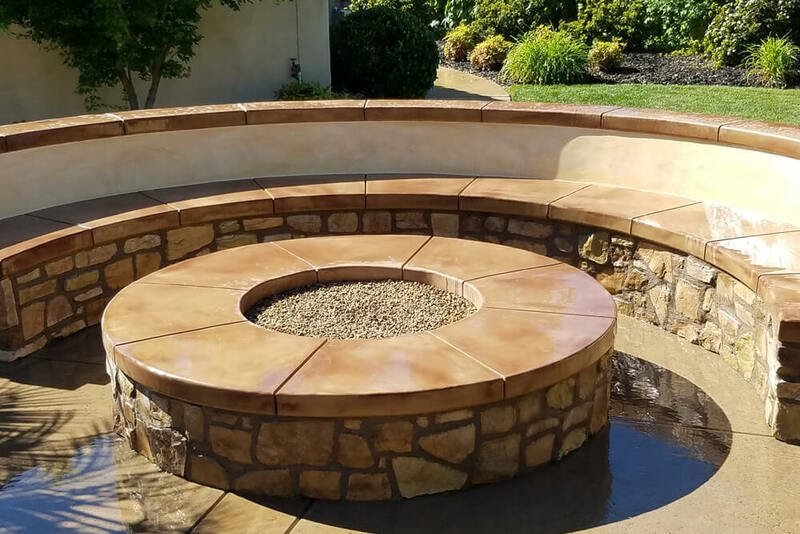 Custom Image Hardscape is proud to serve the Rocklin area as one of the top custom outdoor fireplace and fire pit builders in the local Northern California area, including Sacramento, Roseville, Folsom, and El Dorado Hills. Building custom luxury outdoor kitchens, fireplaces, or poolside decking are a few other projects we cater to the local community. We are a company that focuses on customizing fire pits with the homeowners’ unique design. If interested in a one of a kind luxurious feel free to contact us!